I think it's safe to say that all members and readers of this blog hold law enforcement officers in the highest esteem. We know that they never flout the laws they have sworn to uphold without good reason. 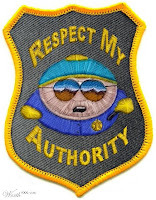 If you are a police officer, trooper, court officer, correction officer, telecommunicator, highway patrol, federal agent, or any other type of police (peace) officer either full-time, part-time or retired that has been disrespected or insulted by another police agency (officer) by not receiving some sort of professional courtesy, please email staff (at) copswritingcops.com with the information. It's chock full of woeful tales of hard-working cops being harassed by other cops. These heart-wrenching accounts are enough to bring tears to your eyes. Once she got to my window, she took my license and told me that I was clocked by airspeed doing 84.9 miles per hour. That seemed a little high, but we know not to argue. She asked why the hurry. I told her I wasn't in a hurry and that I was en route to give a LAW ENFORCEMENT defensive tactics training seminar in Springfield. I actually gave her the business card of my contact at the Police Academy. The same academy that trains the state police! I then mentioned that I have been law enforcement for almost 15 years and would appreciate a break. She then told me that she couldn't do that because she was the "catch car". I then rattled off a couple names of who might be flying the plane that was above (Butler, Galvan). I worked with a couple during a DEA detail once and I KNOW they would give me the nod. That didn't even phase her. I then realized that I was getting a ticket. After stopping hundreds of cops on Lake Shore Drive, some state, I was getting a ticket. I have friends in state police districts 2, 5 and of course Chicago. This troop, Trpr Schroder #3512, from district 6 is the only officer to ever give me a ticket while I have been a police officer. Congrats to you. Look. No one is advocating that we ignore the law. But can't we cut these men and women in uniform some slack? When you see a squad car parked next to a fire hydrant, don't get irritated. That only means the cop is in a hurry and will be moving it shortly. If a cop leaves his car running while he runs into the drug store, don't dwell on the fact that you would get a ticket for doing the same thing. The cop in that case is probably responding to a call and just had to pick up a few necessities because the store closes before his shift ends. As for you by-the-book rookie cops who like to hassle off-duty officers: leave those brave veterans alone. If anyone has earned the right to break the law, they have. How can you expect them to protect and serve effectively if they are held to the same standards as everyone else? I speed all the time, but I haven't got a ticket in 20 years. (You were with me that one time, we were 18, and I overran the Maple Plain 35MPH zone on the way home from a "Nylons" concert.) Since then, I have always avoided tickets by never speeding worse than the cop car in front of me.